You'll enjoy these quality shower doors and tub enclosures. They're clean, simplistic and easily maintained. 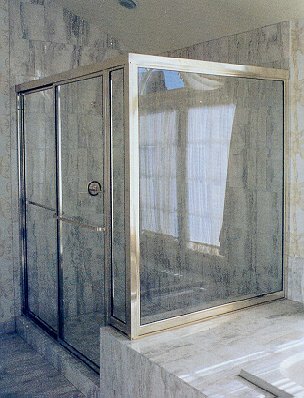 All shower doors and tub enclosures meet or exceed all safety glazing standards and consumer product safety codes. Design:Great Lakes fabricates tub and shower enclosures in a wide combination of fixed, swinging or sliding panels. 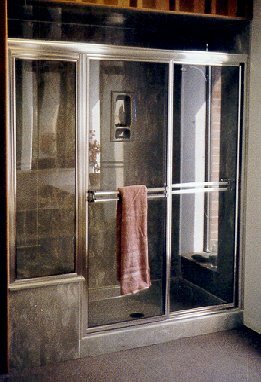 In addition to the styles shown we also manufacture specials such as steam doors or custom designs. Installation:All Great Lakes doors are partially assembled for easy installation. Pictured instructions included. Maintenance:All Great lakes doors have a bright anodized finish that requires a minimum of care. A simple swipe with a towel or soft cloth after use is all that's required to maintain a lustrous gleaming finish. Glass, Options, and Accessories:All Great Lakes doors are glazed with fully-tempered safty-guard® glass, and are available in clear, aquatex, bronze, obscure, reflective or grey tone. Custom etching is available on a quote base only. Great Lakes Shower Door also offers a complete line of decorative hardware to enhance your shower door and bath. The idea behind Bordeaux is simple. It is to construct a premium shower enclosure whose superior quality is immediately apparent to even the most discriminating buyer. A shower enclosure with simple yet elegant lines that fit in the most luxurious bath settings. Structural sections can be custom designed to meet every conceivable configuration of doors, panels and bulkhead panels. Each enclosure is hand crafted to be the exact specifications of each order. Each Bordeaux enclosure is constructed with polished bright dipped anodized aluminum in either clear or gold. Glass options vary from Aquatec to clear and bronze or grey tinted. Custom etched glass is available on a quote basis. Steam doors ore offered in the hinged series. By-pass doors are available with a stay-clean or closed track.